After 2 years in the making, we finally decided to release the first beta. There will be a new version within 2-3 weeks, but we encourage you to start looking and testing this tool. At dotFMP in Berlin in 2016, we got to talk about the hassle of having to manage and monitor multiple FileMaker Servers and talked about how we could work on this. Basically, within a couple of hours, we cooked up the concept and started building the tool. Since this has been a sparetime project, it has taken us some time. But we have been using the tool for our work the last almost 2 years, so we feel that it is pretty thoroughly tested. As this tool was something we needed and we just want to share it with the community, it’s being released as Freeware/Open Source and we really like to have your input. What is FMS WhistleBlower ? This is something we developed and it’s a component you install on all the servers you want to monitor and manage. The daemon/service will collect log entries as well as CPU usage of FMS related processes and feed this information into the MySQL database. The database will have tables, which the daemon/service will write to. The reason for this choice is that we will be generating millions of records. This file is the central point, where you can put in logics. Currently it provides an interface for viewing log entries directly from the MySQL, via ESS as well as providing a dashboard, that shows you the current status of all the server in the level of files, clients as well as whether each of the FMS specific processes are running and how much CPU each process takes up. There is already a bunch of tools in this file, but the great thing is that it’s Open Source, so you can build your own modifications and tools. One example that we’ve built, is a function that watch for whether the Script Engine has crashed. In that case, WhistleBlower will restart the Script Engine automatically. * Download the file, which is a FileMaker file, which contains the bits you need. * Run the SQL creation script, to create a database with the tables we need. * Setup MySQL accounts for the daemon/service. You can create an account for each server you want to monitor, or just a shared account. Then create an account for the FileMaker file as well. 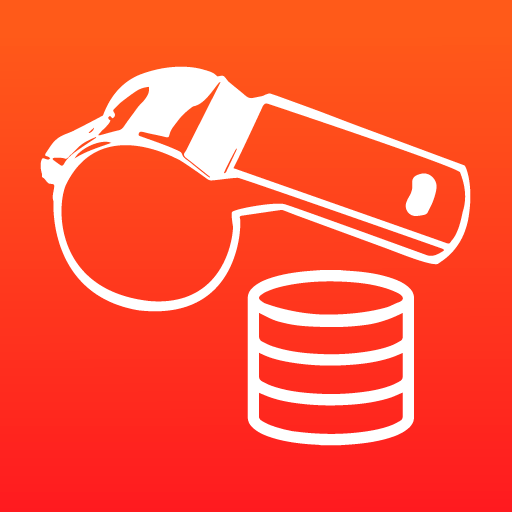 * Setup ODBC connection from your WB FileMaker server to the MySQL server. Also setup a connection from your local machine with the same DSN name. Only needed when you first setup the FileMaker file. * Open the WB FileMaker file and make sure to connect your file in ESS using the DSN to your MySQL. Look through the scripts and look for import SQL steps and Execute SQL Query script steps and make sure to change them to use the DSN to your MySQL. * Add servers as records. Use a serverID, which is what the system uses as unique identifier. Use a short serverID. * Install the Daemon/Service on your Mac or Windows server. After installation, you’ll need to set it up. A screen will ask you to fill out the ServerID you created, the address to MySQL, database name, username and password. Follow the instructions and then the daemon/service will start feeding MySQL with information. * Finally, create a server side scheduled script, that runs every minute. You should pick the script named “SRV || WB Master Serverside Script”. This script is fetching data from MySQL as well as requesting file and clients information from all the servers. There is interfaces for FileMaker Pro, Go, WebDirect. We even built a screen that is specific for a WebDirect entrance from e.g. a Linux box, connected to a HD screen. We have such a screen in our office, which shows us the status, while we are working. Currently we support FileMaker Servers from version 12 to 17 (as long as the daemon can run on the OS version. Mac OS 10.6 is not supported anymore) and we just put in support for FileMaker Cloud (some features) as well as FileMaker 17 via the admin REST API. We know the above instructions are not at all complete documentation or description, but we know you are clever, so hopefully you’ll be able to get up and running. We are working on a release version right now and hope the community will want to contribute. With features, ideas and documentation. On this site, you’ll be able to download the project, by providing your name and email address. We will only use your email address to notify you about updates and new releases. Please check back at this site for news, as we are planning to create a wiki or forum thing and when that is in place, we’ll link from here. i tried to install. Everything seems fine. But..
wbDaemon configured with this params, once restarted, but i don`t receive any data in mySQL Database. Any suggestion? Windows Log seems fine, daemon is runnig. are daemon logs somewhere? this solution is perfect! long time dreaming for something like this. Thank you for your interest in WhistleBlower. Please note that this is a BETA release and have known bugs. That said, on Windows, you will need to start the WhistleBlower Service in the service manager, once you have installed it. The dialog you see after install, should inform you about this.